That time of the year is here again, where mooncakes and lanterns (some with jarring techno music!) take centrestage. Of course, what is Mid-Autumn Festival without spending time with the family and judging from the past two years' celebrations in Singapore, no place does it better than Gardens by the Bay. From now until 10 November 2015, step into the Flower Dome and go on a journey to the Far East, where more than 10,000 Chrysanthemums in a myriad of colours are in full bloom. Long admired for its beauty, the Chrysanthemum is a symbolic feature in traditional Chinese art to depict the autumn season. Unusual varieties such as Spider Chrysanthemums and Pompon Chrysanthemums first cultivated in ancient China and Japan are on display, against the scenic landscape dotted with a moon gate and teahouse, maple trees, and bonsai plants more than 100 years old. In one of the rare occasions where visitors will be able to walk through the Flower Field, we entered through the Moon Gate and found ourselves transported to a crisp Mid-Autumn day in a traditional Chinese garden! Safe to say that all of us - including the SengkangBabies - loved the riot of colours and the scent of fresh flowers in the air then! Did you know that local seniors (aged 60 and above) enjoy free entry into two conservatories until the end of this year? And just for the Mid-Autumn Festival, EVERY CHILD (3-12) who brings along a lantern will enjoy FREE admission to both conservatories too! The promotion is valid from now until 4 October 2015, 5pm to 9pm daily and visitors will have to redeem the admission ticket at the ticketing booth, between 5pm to 8pm in order to enjoy this offer. And what's a Mid-Autumn Festival without some lanterns? Especially if they are gigantic ones! If you want to soak in the Mid-Autumn festivities but only have time to visit ONE event, the Mid-Autumn Festival @ The Gardens 2015 will be it. And the best part? It is ALL FREE for everyone! Compared to the previous two years, I felt this year's edition is a little smaller in terms of scale. But the lanterns are no less colourful or vibrant though; in fact they do look more intricate and fun this year! 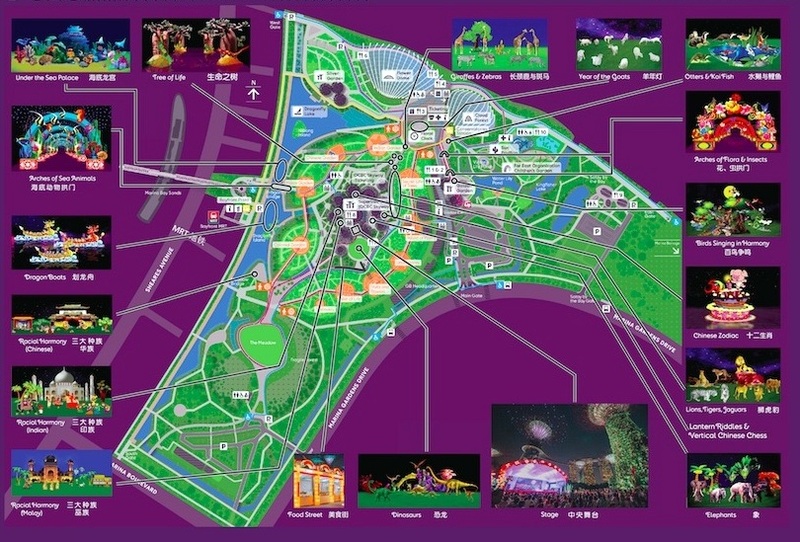 And the good news for families is most of the lanterns are concentrated at the Supertree Grove area, which equates to less walking for younger kids. You can either choose to start at the Visitor Centre of Gardens by the Bay, or at the Supertree Grove where the main action is taking place. Seventeen different sets, comprising of 300 lanterns in total, will be on display at various locations. See the different spaces around the Gardens come to life with a kaleidoscope of light and colour, as the lanterns light up with a dazzling display of elaborately handcrafted lantern sets that celebrate the natural world. One of the more majestic and towering lanterns this year has got to be the story of Chang-Er lantern display at the Golden Garden (near the Visitor Centre). Look out also for 50 goat-shaped lanterns painted by members of the public in a lantern-decorating competition sponsored by Kwan Im Thong Hood Cho Temple. These can be found near the entrance of the Flower Dome. As we made our way to the Supertree Grove, there was no chance we could have missed the eye-catching life-sized giraffes and zebras lanterns. Love how the lanterns are made to blend in with the natural environment of the Gardens! An annual favourite of the monkies is the Chinese Zodiac display, which is next to the sheltered pathway enroute to the Supertree Grove. As the monkies scrambled to locate their individual zodiac animals, it turns out that everyone also had the same idea. The main highlight belonged to the magnificent Dinosaur lanterns display at the heart of Supertree Grove, where towering and majestic dinosaurs (some can even move!) up to 25m long dot the grass field. Be sure to located the other lanterns around the Grove as well, including those depicting Racial Harmony themes and even more animals like lions, tigers, jaguars and elephants! Feeling famished after all the walking? Stop by the Food Street at the Supertree Grove, with more than 30 stalls offering a variety of food choices from local mainstays like kueh tutu, muah chee and vadai, to new favourites like fried Oreos and kebabs. For even more spectacular lanterns, head to the Dragonfly Bridge. Here, we walked through Arches of Sea Animals - very pretty and colourful, which I think will appeal most to kiddos! Personally, I have always loved the huge floating lantern displays on the lakes and this year's lanterns did not disappoint. The majestic water lantern displays on Dragonfly Lake featured Dragon Boats and an enormous Sea Palace. These lanterns are located close to the link bridge from Marina Bay Sands. Do indulge in the free nightly performances at the Supertree Grove put up by local music and cultural arts groups such as the Singapore Hokkien Huay Kuan Dance Theatre, Nam Hwa Opera and Dicapella Dizi Ensemble too. Malay dance group Azpirasi and Indian classical dance group Apsaras Arts will add a multicultural element to the performances. For more information on the performances, click HERE. For a night out of fun with the family (hopefully, it's haze-free! ), the Mid-Autumn Festival lanterns at Gardens by the Bay will more than suffice. Best of all, it is all FREE! But do hurry though as the lanterns will only be up until next weekend (4 October 2015)! *PSSST, there will be FIREWORKS on 3 October 2015 at 8pm, Supertree Grove too! *From 25 September to 4 October 2015, 5pm to 9pm daily, every child who brings along a lantern will enjoy free admission to both conservatories. *In celebration of SG50, local seniors (aged 60 and above) can enjoy free entry into two conservatories. Accompanying caregivers of seniors can also enjoy 50% discount into two conservatories. Valid from 1 June to 31 December 2015. For promotion details, visit HERE.